Jerusalem, Israel - Police arrested extreme right wing activist Noam Federman today, after arriving with his children at the Temple Mount with a goat that he planned to sacrifice for Passover as a Korban Pesach. 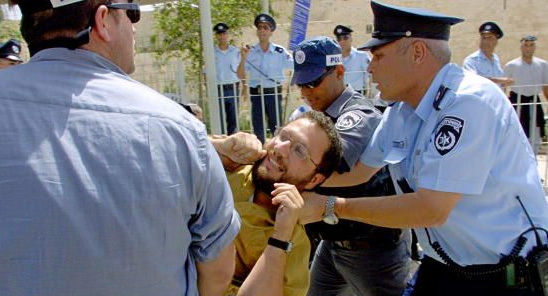 Federman was stopped by police at the gates of the Temple Mount, and taken to the nearby police station by squad car. After his investigation, Federman was released with his children, aged 12, 10 and seven-years-old, that accompanied him to the holy site. Police banned Federman from going near the Old City in Jerusalem for one week. “It’s a disgrace that the police prevent Jews from keeping the Passover sacrifice mitzvah,” Federman said. “Detectives came and claimed I was violating a court order. I asked them which order and they said ‘you’ll see it at the station’. There, it turned out there was no order, but I was detained for questioning because of conduct that could have disturbed the peace,” he continued. It's a big chesed to him that he was arrested. He would have violated 2 Torah commandments which require death in the hands of Heaven. Slaughtering a sacrifice outside of the bais hamikdosh and sprinkling the blood outside of the bais hamikdosh. Mr. Federman, I would have taken you straight to the pshyciatric center, and maybe I would allow the goat to be with you.. what a nutcase! I believe you might be mistaken. The Korban Pesach does not need the Beis Hamikdash. Why don't you post your name, so that we can rightfully identify you as the poisek and gadol hador - you dolt! Happy and Kosher Pesach to all. Pesach is an acronym for peh-sach - the mouth talks, a reference to the mitzvah of sipur b'yitzias mitzrayim. May all of klal Yisroel use their mouths (& keyboards) to talk divrei Torah and divrei chayrus, not dvarim bitailim and shtusim asher bodu milibam! He was headed to do it INSIDE, not outside. No avera there. Actually, this photo looks like a human is about to be shechted. I hope they don't hard the idiot. This guy needs a rest. trouble maker stays trouble maker. he could've called the chabad guy in puhkipsee(howver u spell it) and gotten dropped by hot air balloon with goat on the temple mount. Baa! You won't get me until Chad Gadya! He knew that they were going to stop and arrest him; he just wanted to make a scene. There was no way he was getting to the makom hamizbayach nor did he know where it is so inside is not good enough. You are totally incorrect. That would be an issur of bamos and the dinim of shochet and maaleh bachutz apply. You can only bring it on the makom hamizbeyach. Even if he is a Cohen, you don't have tzits meratzeh. If he is not a cohen he is a zar and is chayav for that. Reb Noam is MY fellow Jew and I love him unconditionally. Be strong and of good courage. Moshiach now! So to sum up all the other posts: This guy is a nutcase and we all hope he has a chag kasher v'samayach in an appropriate institution. I also hope someone is kind enough to invite his wife and children to their sedorim. Are you all seriously overlooking the fact that he tried to bring a GOAT for the korban which is notably done with a LAMB.....? Between the naked Chametz buster and the mad goat shechter, we are off to an interesting start to Pesash! Chag Sameach, Everyone! the cops are pulling his beard reshaim! Did he have Matzoh and Murer there so he can make Zeicher Lmikdesh Kehilel.? The Rambam says a korban Pesach should be brought even without a Bais Hamikdash. He was involved in a discussion with a number of other gedolim including the Chasam Sofer about the possibility of bringing a korban pesach today. He never actually wanted to make it due to the problems. The Rambam means that it should be brought properly even though the bais hamikdosh is not built. He did not mean in impurity in the wrong place by a person that is not fit to bring it. The main avoda of a korbon is sprinkling the blood. Without that, it is totally posul. He didn't mean that it should be brought improperly. He meant that it could be brought in purity by the proper people in the proper place. This is an open gemara - makrivim af al pi sheain bayis. How come none of the great rabbis of previous generations ever suggested that this be done? Apparently, there are issues that need to be resolved first. There is no zrikas hadam on the korban pesach, only shficha k'neged hayesod. seh samim, zachar ben shana yehye lachem. Min hakevasim umin ha'izim tikachu. “ He didn't mean that it should be brought improperly. He meant that it could be brought in purity by the proper people in the proper place. Maybe the reason why the Rabbis did not bring the korban is because of the "Police". In other words, maybe the idea of gulus is that the Jews were actually kicked out of the land. You can't bring the korban without access to the land of Israel. wha the hell is your problem always looking for ways to maake machloikos, for that reason the beis hamikdosh was destroyed, ma hakesher think b4 you write! perhaps the physical structure of the beis hamikdosh was destroyed, but it spiritual presence shines on forever. I dont see the probelm with what this man tried to do.Perhaps he felt the shechina of the beis hamikdosh and wanted to bring a korban pesash.More power to him ! Accoding to the sdei gemel on hilchos kobonos in perek tes he concludes that you are absolutely not allowed to bring a korbon bzman hazei. Am hooretz you. "Korban pesach meivi min hakvosim O MIN HO'IZIM". Many did suggest it. That's what the whole discussion was about. None of them did it because the Turks didn't allow it. What would they have done had the Turks allowed it? Who knows, but lo ro'inu eino ra'ayoh. i don't claim to be a great scholar but beside all the other shailos, aren't we all considered to be in a state of impurity and therefore unable to bring korbanos?don't we all need the tenth para aduma before korbanos can resume? if we need to be in a pure state to bring a korban (and perhaps only the ashes of the porah adumah can remove our impurity) then perhaps we should not be allowed to daven? have a happy pesach everyone ! You are right but certain korbonos are permitted betumah. Tumah hutra betziboor by korban pesach. Tumah is permitted (or ignored) when the majority of the people are tamei for a korban pesach. Tum'ah hutra betzibur. If the whole nation is tomei, then the korban is brought anyway. Only if everyone is tohor and a few individuals are tomei do those individuals have to wait till Pesach Sheni. I wish all the goat carrying members of Karbanos Today well. What I wonder is if this kind of extremism is any different than the garden variety, eat matzah with my ham and cheese variety to celebrate passover version of extremism, just in the other direction. For those who have posted harshly against others in this thread, please remember that if the Torah were to be told while standing on one foot it would be "love your fellow neighbor" - that means be respectful of the opinions of your fellow Yiddin folks! I hope your joking....The Sdei Gemetl, Z'zl, is one of the great achronim and authorized many famous books and essays on the the talmud. Sdei Gemetl? Would you mind telling us his real name (and also what "gemetl" means in loshon hakodesh). ...He's chayav for being a nut case and disturbing the peace. He needs to get a life!!! ...Apparently you are a half Jew (and half Moslem). We have a S'dei Chemed. The Egyptians have a Gamal (as in Abdul Gamal Nasser) You still have that Arabic Accent. Thank You!!! “ Why don't you post your name, so that we can rightfully identify you as the poisek and gadol hador - you dolt! ...not on the First Three nights of Yom Tov...!!! ...Don't know who the [Yiddishe] S'dei Gemel is, but there's a difference between "Authorizing" and "Authoring"!!! This is the same Anonymous who is constantly quoting "gadolim" whom I suspect he has made up, as well as giving the title "gadolim" to real rabbis who are fifth-rate at best. That's why I asked. There is no "Sdei Gemel" or "Gemetl", he just made it up. A goat is fine. See Shemos 12:5. 2.) Mizbeach built by the whole eidah or its representatives (Sanhedrin or a king (and maybe a government elected by majority of people). A private mizbeach on the correct location is still a bamah (according to most poskim I know, I still haven't find an opposing view). Anyway, from the comments above I see we are not ready for the korban since we don't know the basic halachos (i.e. what animal can be used). Let us all be fluent in the basic halachos of kodshim! There is a wondeful sefer around called Avodas Hakorbanos, it has a short halacha yomis for every day. It was a project of the Chofetz Chaim, written by his son-in-law (with enthusiastic haskamos from R' Chaim Ozer and R' Chaim Brisker, the new edition has a bracha and praises from R' Chaim Kanievsky) . You can find it in two formats (pocket, full size) in most seforim stores (or they can order it for you). what a retard!! but he`s has got a point when it come the cops in israel they are all not religius and hate chareidim! !